Obituary for Gilbert Dokis Sr. 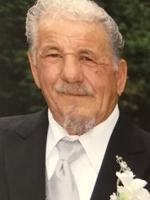 The family announces with sorrow his death in Sturgeon Falls at the age of 77 years. Son of the late Sylvester Dokis and Mabel Dokis. Predeceased by his wife Ninabelle Couchie. Sadly missed and lovingly remembered by his three boys Dean (Stephanie), Gilbert Jr. (Pamela) and Cheyenne (Lizanne) as well as his step daughter Brigitte Danis (Lee). Beloved grandfather of Dean II, Ninabelle, Destinee, Connor, Abrielle and Aleah and great-grandfather of Hunter, Emma, Ava and Mia. Brother of Emery (Mary), Clarence Sr. and Gerald (Isabel). Predeceased by his brother Sylvester Dokis Jr. and by his nephew Kelly Dokis. He also leaves behind many nieces, nephews, extended family, friends as well as his two fur babies Lincoln and Carpenter. The family wishes to express heartfelt thanks to Claudine Restoule and to the staff of the West Nipissing General Hospital for the excellent care given to Gilbert in his final years. Gilbert worked for the Dokis Public works department for over 30 years. In his spare time, he enjoyed fishing and playing bingo. The family will receive friends at the Michael Dokis Community Complex, Dokis Bay, Wednesday January 2nd, 2019 from 2-5 and 7-9. A funeral service will be held on Thursday January 3rd, 2019 at 11 am at the Michael Dokis Community Complex. Funeral arrangements in care of Theoret Bourgeois funeral home, Sturgeon Falls. Donations to the Canadian Cancer Society would be appreciated. This obituary is protected by copyright by Sturgeon Falls. Proudly Serving the Community of Sturgeon Falls. Sturgeon Falls is located in the province of Ontario, Canada.